They have way too much white junk under those dresses. Look at look that junk under Aurora's dress. i saw an image of Belle on a stand holding disney posters in which it looked like she had a white junk convention under there with three or four layers. Guess they will be virgins for the rest of their lives with all that in the way. I had a dream in which B-29s were bombing Cinderella's castle because the crews blamed her for attacking their country. They knocked down half of it with the clock tower. That goes back to the part of the discussion I posted in here about the skirt's shapes coming from many layers of petticoats (which I prefer) instead of cages, but I think they apparently makes the dresses heavy whereas cages make them lighter. I prefer petticoats as well over cages. I think Pocahontas is the only princess with a cage in her ballgown. Glad we agree! I wanted to share a few images. I may every once in a while post some Cinderella images I like, I don't know, but here are some I've wanted to post for a while. And next, the transformation scene, in pencil animation! Which I wish to God Disney would finally show, in full, as a bonus feature on home video! Well, actually I'll post it in the post after this. I can't post more than three images per post, for some reason. Lets try this again. Look at all that white mess under Aurora's dress she doesn't need that. All that white is one petticoat and it is under the dress to give it fullness and I like it. I have to add, I forgot that I once saw a color key for Cinderella that called Cinderella's swags a bustle! I don't remember if it was from the Platinum release or if it's among my many images. I will look for it someday! Anyone interested in knowing? The petticoats are more visible in the clipart anyway. They're rarely seen in the actual films except for the dancing scenes, mainly for Cinderella and Aurora. 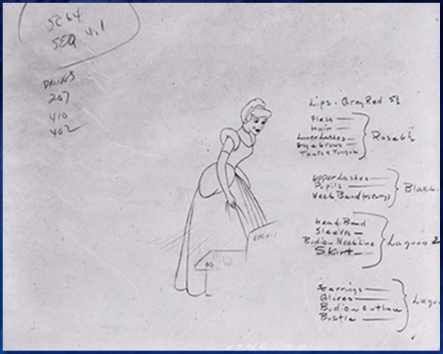 If you can find that image that labels Cinderella's dress with a bustle, I'd be interested! Ok, when I have to time to look for it, I will. I don't know when, but some day! From Beauty and the Beast. Does Belle have an army under there? She doesn't need all that. I think the main reason for that is because if they only used one petticoat (or none at all), then everything under her dress would show and Belle isn't Jessica Rabbit. Yes, that is probably right, too. The pettocoats cover the girl's bodies, too. But bradhig, you must not have read what we said in the earlier discussion, that fullness of skirts could be achieved by many, many petticoats under the skirts, so that's probably why Belle has so many and Cinderella probably had that many, too. So, I just did a little perusing through my Platinum Edition of Cinderella, worried I wouldn't find the image with the indication of Cinderella's swags being called a bustle, because I had done a search for that same thing a long time ago, but I must have looked in the wrong places last time, because this time I said I would search through everything, and lo and behold, I found it! Do think it must be a bustle now? Oh, and did you think anything, even just midlly liking, the Mary Blair "So This is Love" image or the transformation in pencil skecth form? Wow, you found that picture quickly! Thanks for all your sleuthing. 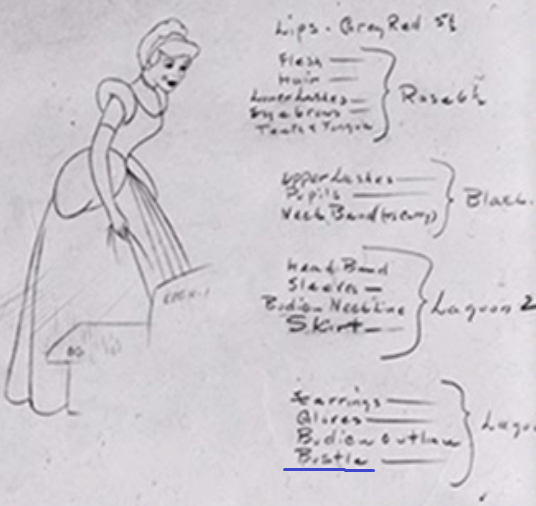 Yes, that word likely is bustle and it definitely is referring to the two poofy things on Cinderella's dress since it has the same color as Cinderella's earrings, gloves, and bodice outline. I guess you've been right all along about Cinderella having a bustle. To be honest, I still don't see it as a bustle since when I think of bustle, I think more of what Anastasia and Drizella were wearing for their ballgowns or even Jane Porter's yellow dress, but I've never pretended to understand Victorian fashion anyway. I'm not the expert here so it's nice that we have this confirmed once and for all. I meant to respond to your earlier post about Mary Blair's concept art but I got distracted with all the discussion about the petticoats. Thank you for reminding me! The concept art is gorgeous and I don't think I ever noticed those pink roses before in the second stil. I checked the finished film, but the roses are absent in the same scene which is a pity. They're not necessary, but I do like their addition in the concept art. Otherwise, I like the movie version just as much as the concept art. As for the transformation sequence, the animation is absolutely stunning and nothing in CGI has ever been able to compare. I'm glad we have this test sequence since the original has been butchered on DVD and Blu-Ray. I think I must have seen that sheet with what's supposed to be what color and the bustle and in the back of my mind I forgot about it, and that's part of why I believed it was a bustle when discussing it with you without knowing if it was for sure or not! 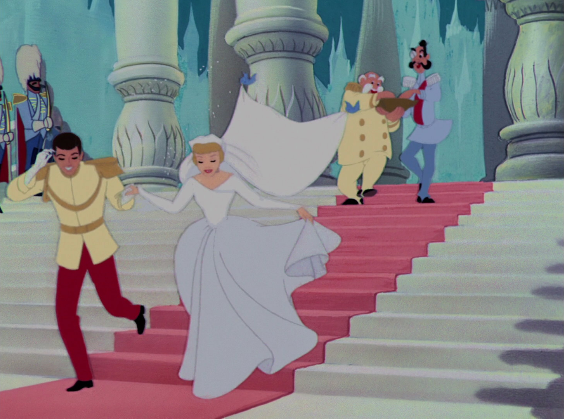 I agree that Anastasia's, Drizella's, and Jane's are more what an actual bustle is, but it's a fairy tale, and also, the dress was created by a fairy godmother. So I can see imagination being used to make something never seen before or of the times. Thank you for your comments on that Mary Blair art and the transformation in sketch form. 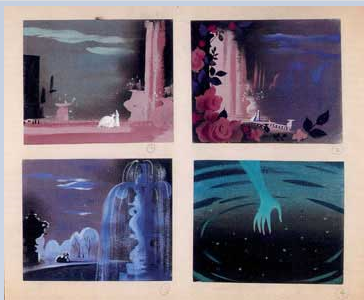 I love the Mary Blair art, and the roses are really beautiful, I agree. I actually don't mind them being replaces by the swirly foliage in the final film because I feel like Cinderella is more about curly green vines than flowers, and then again I also think roses ae perfect for Cinderella, so I can like it both with them and without. I just love the colors and scale and compostiion in Mary Blair's version. And yes, I agree, CGI has never come close to the beauty of that transformation or any Walt Disney or Reniassance animated classic! I don't watch South Park but that's a fun video. It's always nice to see a Disney film mentioned in pop culture without being ridiculed. Thanks, glad you liked it! And yes, I completely agree it's great when Disney is reference and not ridiculed. I like South Park and watch it a lot and actually they really seem to like Disney. I wanted to post these amazing (to me and hopefully to some of you!) artworks that you could only buy in the Disney Parks but that I got. I'll just post them in one big image since the only good images I could find of the two first ones were small. Let me know if the image is too big, Sotiris. The first two are pictures from Don Williams. The first is called "Until Midnight" and is the transformation of Cinderella's look with images ripped right from the film! Every color is correct except the Fairy Godmother's blouse and the leaves and vines on the bottom of the coach's body. So that means white and silver Cinderella dress! A friend pointed out to me there are only two horses which is incorrect for that scene, so that's a small detriemnt to the painting but whatever. I bought a very large framed giclée of that one, as it was the first Cinderella art I really wanted framed, and that I had also encountered in front of me, since I found it in Disney World in 2017. The second is called "At the Ball" with an image based on a clipart which in turn was based on the very first shot of Cinderella and the Prince dancing, but with a gorgeous background taken right from when Cinderella leaves the Prince after the clock starts to chime. I got a print of that from ebay. 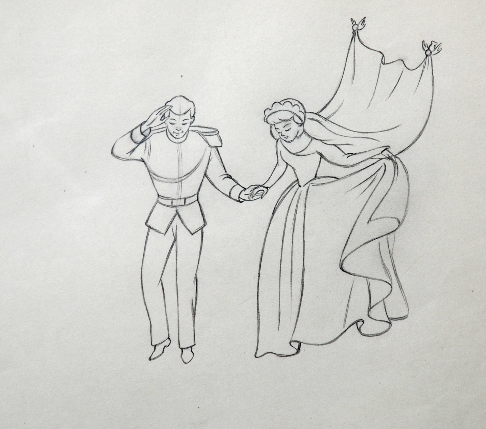 The final image is by Daniel Killen, called "Preparing for a Ball", and is my absolute favorite, depicting Cinderella's transformation, with poses based on what I swear I have at least seen already for Cinderella and the Fairy Godmother, but for the life of me cannot recount for the rest of the characters or the coach. The backrounds are smartly and creatively taken from the view of the castle from Cinderella's cheateau tower window when Cinderella says, "Oh well, what's a royal ball?" and from the garden when Cinderella collapses onto the bench under the willow tree in tears. I love everything about the picture except the shading of the characters is not perfect and not given in eveness to all characters, the magic dust could look a little more like how it did in the film, and I don't like that Cinderella's pose was taken from a clipart I think I remember, but if her pose is actually re-drawn enough that it's not exact, then it only slightly bothers me, as it would be a little boring if it was a repeat of the same "arms and head up in the air" pose all the time, like in "Until Midnight". I just wish it was a brand new pose inspired by the original one. But the colors are perfectly correct (well except the wheel of the coach, it should be whiter), so yay silver and white dress, and it just looks so awesome and freaking beautiful I overlook the re-used poses and make it work for me when I view it's majesty. I own a print of it, but I really wish I had the first two in print with this last one in a giclée. Hey, can anyone post the clipart I believe Cinderella's pose in the last one, "Preparing for a Ball", came from? I don't even know if I have it on my computer but if anyone can find it and post it, I would very much appreciate it! She was blonde-haired and blue-dressed in the original clipart. Last edited by Disney Duster on Sat Mar 02, 2019 3:52 am, edited 1 time in total. Thanks for sharing! It's a shame there are a few coloring mistakes on the first image (Until Midnight) as well as the green carriage wheels in the last image (Preparing for a Ball). I love the view of the palace, as well as the bench in Cinderella's backyard, in "Preparing for a Ball" as well. The inclusion of Bruno, Major, Luke, and Bert is nice as well since usually only Jaq and Gus get included. I suppose those four characters are instrumental in getting Cinderella to the ball so that was necessary. The clipart you are thinking of is this. 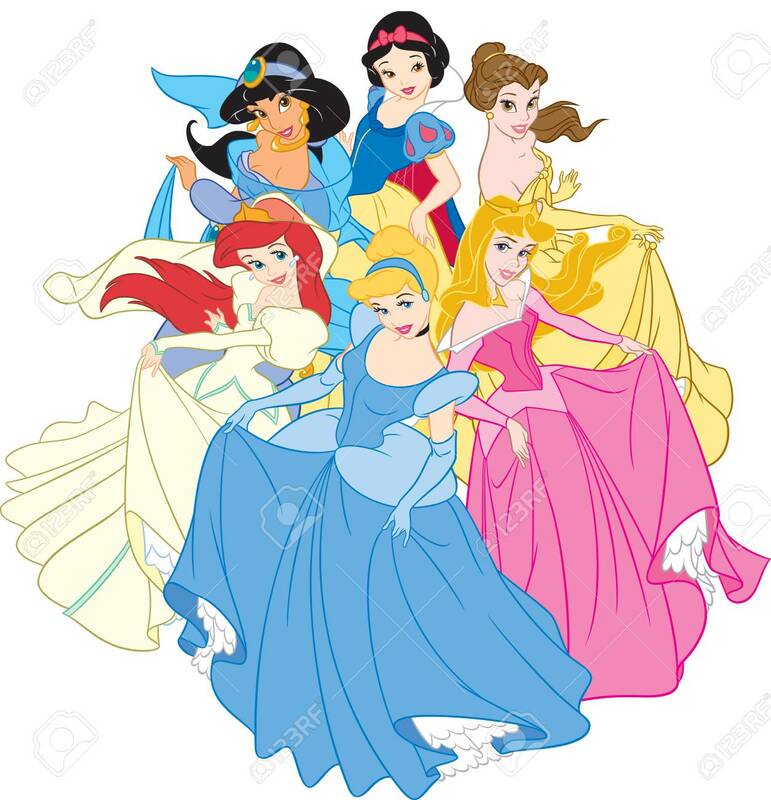 I think Disney was using this style for some Japanese or Asian products with the princesses back in the early 2000s because I remember a lot of images with them like this. I couldn't find a single pose of Cinderella like that without the rest of the princesses though so sorry. 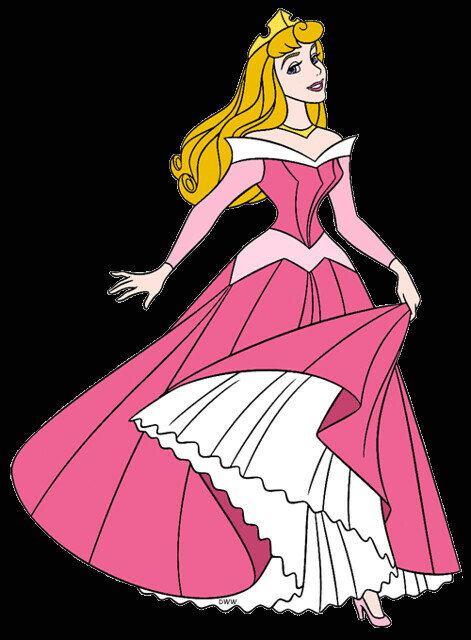 I wish Disney would recolor all Cinderella's clipart to be more accurate. Your welcome! Thanks for commenting! I, too, love seeing the castle in the background. And I thought that was the bench in the background, too, but it's actually Lucifer! I'm at a friend's house for a few days so I can't post a bigger picture to show you yet, but if you would like me to post a bigger picture just say so and I will! And yes, it's awsome we see all the rest of Cinderella's animal friends. And omg you found the exact clipart I was thinking of! I don't care at all that it's with the other princesses! And yes, I saw that image on Japanese web sites first! It looks like he slightly re-drew the pose, so I'm very happy about that! Thank you for finding it!